The most important part of Knox is the people! Our congregation has heart. Listed below are people in our congregation doing great things in the community. As a teacher and behavioural specialist, Sue Adair travels from school to school in Huron and Perth counties teaching children strategies to cope with anxiety and how to calm themselves. But in January 2015, when she was diagnosed with breast cancer, Sue could not calm herself. 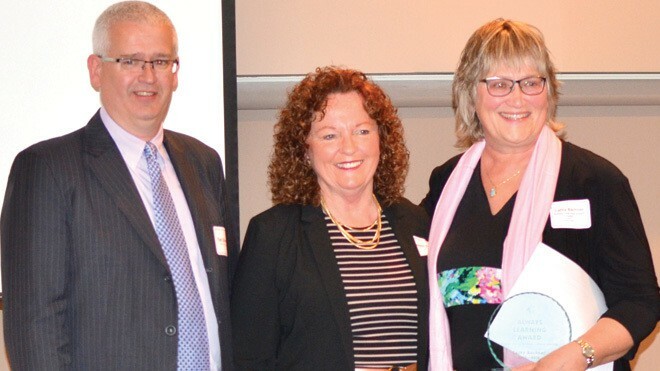 Among the many “reinforcements” who supported Sue Adair (pictured left) during her breast cancer journey was her sister, Jane-Ann Parker (pictured right). The Stratford mom of three couldn’t sleep. She couldn’t stop her mind racing to a place of doom. It took friends who were cancer survivors to get her out of bed in the morning and encourage her to arm herself for a fight rather than self-pity. Those friends, and many others Sue would meet during her cancer journey, were her strength, her “reinforcements.” She is now stepping into that role for others as a speaker at Breast Reconstruction Awareness (BRA) Day on Oct. 19 at St. Joseph’s Hospital. Presented jointly by St. Joseph’s Health Care London and London Health Sciences Centre, BRA Day is a national campaign to promote education, awareness and access for women wanting to know if breast reconstruction after a mastectomy is right for them. Whether a woman is scheduled for a mastectomy, had the surgery recently or many years ago, all are invited to learn about the options directly from leading plastic surgeons, hear from women who have undergone the surgery, view real results first hand in the women’s only ‘show and tell lounge’, and discover the St. Joseph’s Circle of Sharing support group. In addition to speaking, Sue will be among volunteers in the show and tell lounge this year. She’s thrilled with her reconstruction results. But breast cancer for this 54-year old was a 1 ½-year ordeal that, at times, she felt would never end. After five months of chemotherapy, Sue chose to have the double mastectomy and reconstruction all at once, in a single operation. Story courtesy of St. Joseph’s Health Care London.